A simple, 8-ingredient ice cream (only 5 if you use store-bought pie crust!) that tastes just like coconut cream pie! An easy, no-bake, no-stove, no-churn, but totally delicious summer treat! I’m just going to say it: I don’t really like pie. I mean, if my only dessert option is pie, and there are no cookies, or cakes, or cheesecakes, or brownies, or cupcakes, or puddings, or crisps, or cobblers, or sweet rolls, or doughnuts….. I’m probably going to take the pie. It’s not that I completely dislike pie, it’s just that it’s kind of on the bottom of the list of fudgy, creamy, rich desserts that I love. If it’s a cream pie, or an Oreo-crusted pie, or a graham cracker crusted pie, it’s definitely higher on the list. 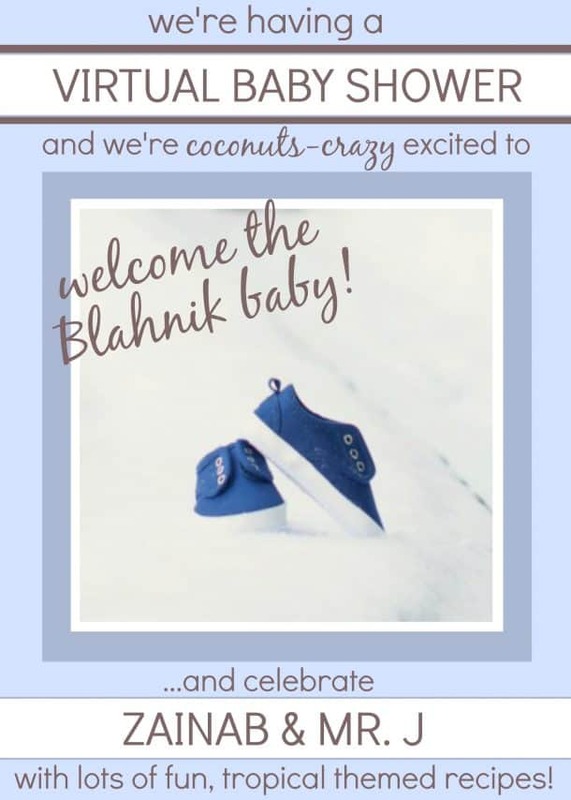 But I’m currently obsessed with all kinds of homemade ice cream, and when I found out we were going to throw a virtual baby shower for Zainab of Blahnik Baker and she loves coconut, I immediately wanted to make a coconut cream pie ice cream! I was kind of going back and forth about putting pie crust in the ice cream. I wasn’t sure if it would get soggy and weird, or how it would taste, but my friend Danielle from Live Well Bake Often convinced me it was a good idea, and so I went for it. The only problem was, I’d only made one miserable pie crust in my life. For obvious reasons, I just don’t make a lot of pie. I went searching for an easy recipe I figured I could manage and I came across this one on Martha Stewart. I thought it was kind of strange that it didn’t have any baking instructions, but thankfully it’s pretty easy to see when a plain pie crust is ready! It turned out so well! And now this will be my crust recipe for all of my pie-making endeavors in the future. I wasn’t sure how much I’d like the texture of the toasted coconut in the actual ice cream, so I sprinkled some on top just to get a taste – feel free to stir some extra in if you want! I’m going to say though, that this Coconut Cream Pie Ice Cream has almost made me a pie lover. I think it might be because the creamy filling to pie crust ratio is so much higher than a normal pie – you get just enough pie crust taste and texture to remind you that it’s supposed to taste like pie! And if you’re a pie crust lover, you can always up a bunch more pie crust to the ice cream before freezing. Anyway, on to the baby shower! Be sure to stop by Zainab’s blog The Blahnik Baker and check out her amazing treats and say congrats while you’re at it! I can’t wait to see pictures of the little sweetheart! 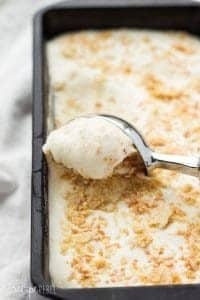 This Easy No Churn Coconut Cream Pie Ice Cream is loaded with toasted coconut flavour and has a full crushed pie crust inside! For the pie crust: Combine flour, salt and sugar in a large bowl. Cut in cold butter with a pastry cutter (or use your hands!) until crumbly. Stir in 4 tbsp ice water and mix with your hands until dough comes together in a ball, adding in additional ice water if necessary. Form in a disc and wrap in plastic wrap and refrigerate for 1 hour or more. Preheat oven to 350 degrees F. Roll out dough to roughly fit a rimmed baking sheet and bake for 12-15 minutes until golden brown. Set aside to cool. Ice cream: Whip cream until stiff peaks form. Slowly fold in sweetened condensed milk and coconut extract until totally combined (being careful not to deflate the whipped cream). Crumble about ⅓-1/2 of the baked pie crust and stir into the ice cream mixture. 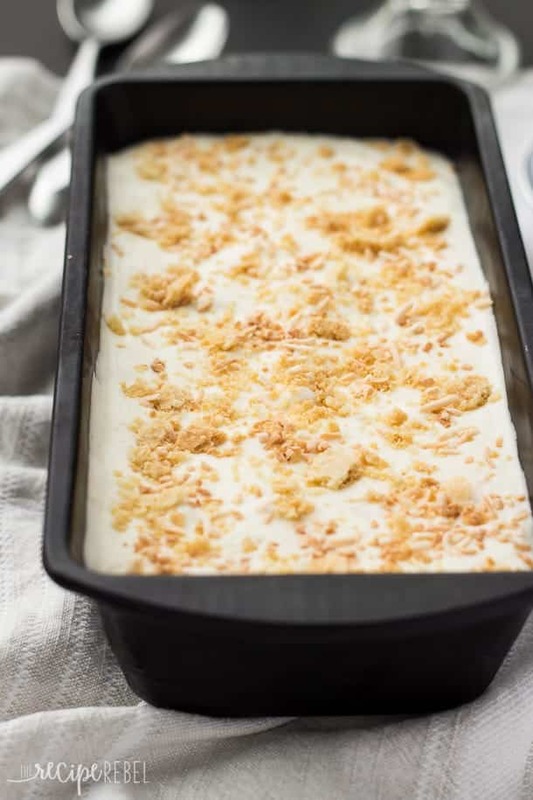 Pour into a ⅕-2qt container or loaf pan and sprinkle with additional crumbled pie crust and toasted coconut. Freeze for 5-6 hours or until firm, then cover with plastic wrap and keep frozen until serving with remaining pie crust. Combine flour, salt and sugar in a large bowl. Cut in cold butter with a pastry cutter (or use your hands!) until crumbly. Stir in 4 tbsp ice water and mix with your hands until dough comes together in a ball, adding in additional ice water if necessary. Whip cream until stiff peaks form. Slowly fold in sweetened condensed milk and coconut extract until totally combined (being careful not to deflate the whipped cream). Crumble about 1/3-1/2 of the baked pie crust and stir into the ice cream mixture. Pour into a 1/5-2qt container or loaf pan and sprinkle with additional crumbled pie crust and toasted coconut. Freeze for 5-6 hours or until firm, then cover with plastic wrap and keep frozen until serving with remaining pie crust. You might also like these cool summer treats! 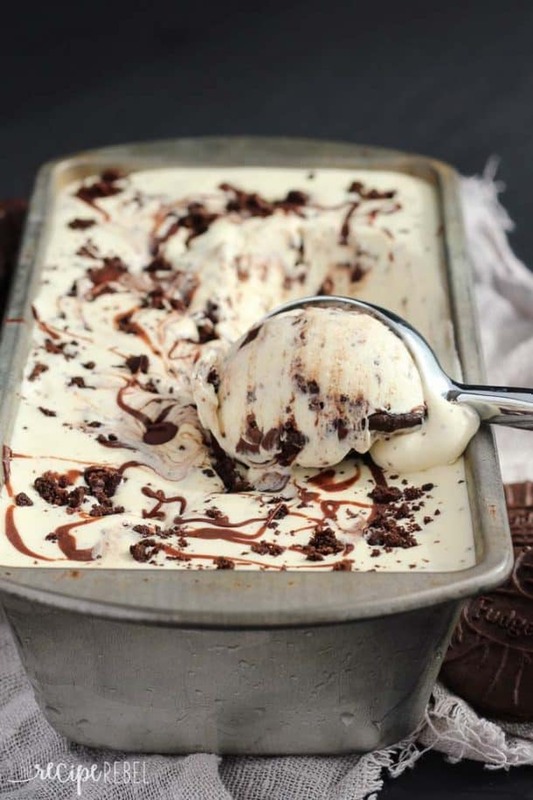 No Churn Cookies ‘n’ Cream Ice Cream with Nutella Swirl! Oh my goodness…so easy to make…do believe this may have made my husband fall in love with me again! My advice RUN DONT WALK TO MAKE THIS!! I LOVE this no-churn ice cream recipe because it’s perfect for people like me who do not have an ice cream machine!! I love that you added pie crust to the ice cream to make it taste like an actual pie. 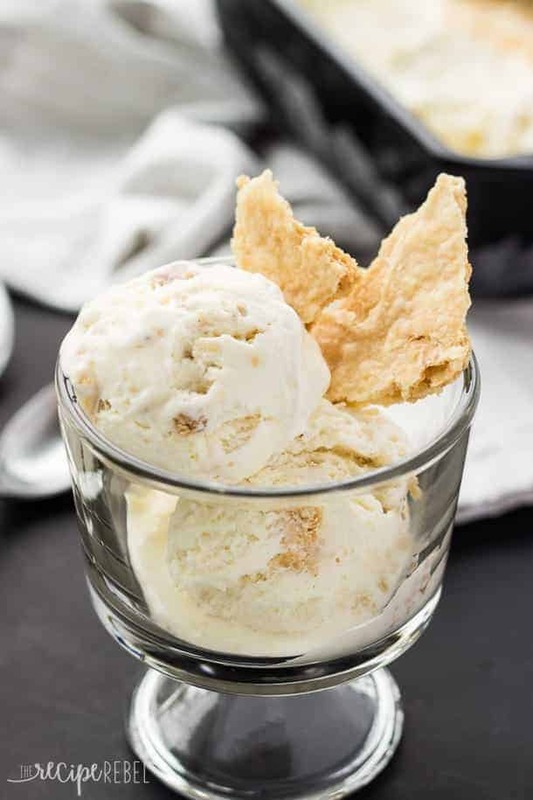 This ice cream looks just amazing and I definitely need to make it soon! Pinned! Thanks Stacey! I couldn’t believe how well it worked! I love this! I’m a pie girl, though I don’t think I’ve ever had a coconut cream one! I still haven’t tried making a no churn ice cream, but it’s definitely on the to-do list. It sounds so easy! I totally share your view on pie – it is definitely on the bottom of my dessert list. However, pie ice cream, I am totally on board with that! This looks amazing! Yeah for pie and ice cream together! I love this coconut cream pie version! Also, I still need to rephotograph the ice cream I made, but yours looks so much better than mine lol. Love this, Ashley! Who wouldn’t want a huge bowl full of pie in ice cream form!? Yum! I haven’t stopped thinking about pie crust in ice cream since Danielle mentioned it haha I love pie, but I definitely have a pie hierarchy. I’ll go for apple first if it’s available, then strawberry rhubarb, then cherry…but I actually don’t like pumpkin or pecan pie. Too sweet I think? This coconut cream pie ice cream looks fabulous! How fun that all of the recipes for this baby shower are coconut-themed! This ice cream looks incredible! 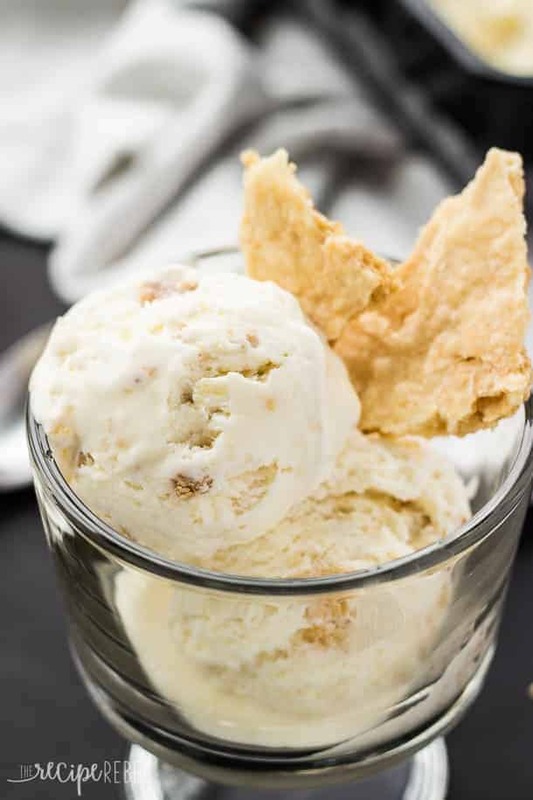 I’m loving your photos, and now I’ve just got to try ice cream with pie crust in it! I’m actually a big pie fan, and combined with ice cream I think it makes the perfect dessert! coconut cream pie ice cream?! This is brilliant!!!!! Ashley, thanks so much for joining the celebration today! so many great recipes. . I want them all!!! No churn? Sign me up! Yes, yes and yes! I need this ice cream in my life. Looks incredible Ashley and the perfect way to toast Zainab’s virtual shower! You are on an ice cream roll!! I think this one might me by favorite. Who am I kidding I love them all. This sounds delicious. I love coconut and love that you used pie crust. Yum. Pinned! PS happy baby shower Zainab!! Now this is my kind of ice cream! I love that it is no churn too. I never plan enough ahead to freeze my churn bowl in the freezer for a day. This will be perfect! Heck yea crust in the ice cream! I had the same dilemma when I made my strawberry-rhubarb pie ice cream and I’m so glad I decided to mix it in! Gotta try this flavor next. Oh I’m not that big on pie either. I always feel like when I say that I’m going to get hate mail or something. Glad to find someone else who agrees! But I do LOVE ice cream and the pie crust in their is a pretty brilliant idea. I’m happy we can celebrate Zainab together! I think I could get into pie if it had caramel pecan apple butter in it! Wow — that sounds amazing! I LOVE no-churn ice cream! This is a perfect summer flavor! 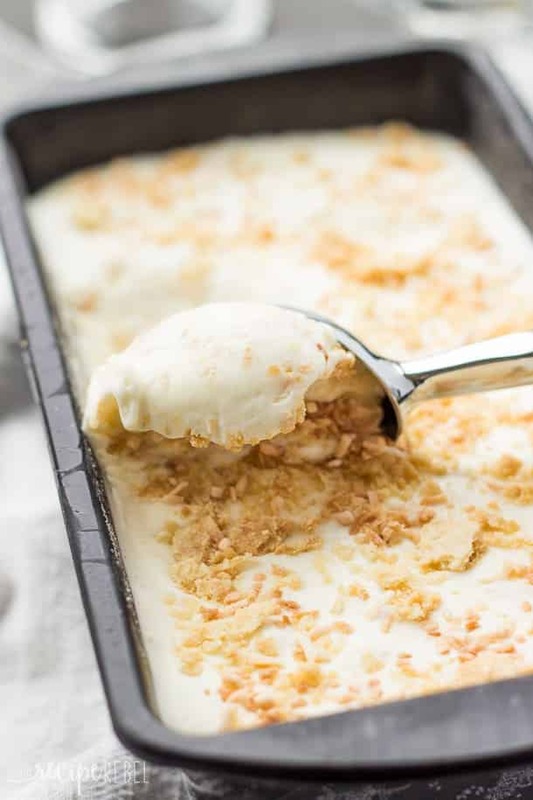 I LOVE coconut cream pie, so I love this easy, no churn ice cream spin on it! Delicious! I’m so in love. Is it too early to have this for breakfast? Pie and ice cream together? My kiddos would go crazy for this. 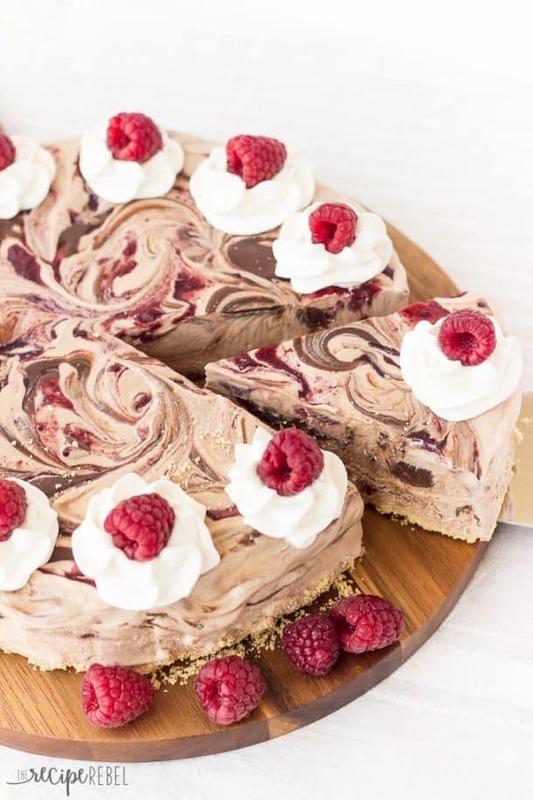 Ice cream is already amazing on it’s own so in pie form it has to be stellar supreme! Haha, and you have the best excuse to indulge them! Congrats friend! Love no churn ice cream and love coconut cream pie! Can’t wait to try this! This is one of those recipes that is perfect for those midnight cravings during a pregnancy! Looks great! I’m mildly obsessed with no churn ice cream and sticking a pie in it is pretty much genius. I actually love pie but the thought of making a homemade crust does not appeal to me! This ice cream looks so good, Ashley! I love that you used a store bought crust in here. Such a great idea!